How do I create my QwikCoach Account for the first time? Click “Submit” and follow the prompts to create your unique password for using QwikCoach. 4. Click “Remember me” if you want QwikCoach to remember your login. Can I change my password once I have an account? 1. Click My Account and make sure you’re logged in. 4. Enter your new password and confirm it. I’ve lost my password? Can I reset it? Yes! Just click My Account, click “Lost your password? and follow the prompts. How do I access coaching content? Just click My Account and select whatever program you’re entitled to use. How do I get started using QwikCoach? Option 1: Review Welcome to QwikCoach. In this section of QwikCoach you’ll have everything you’ll need to quickly understand the value of QwikCoach and how to use it in the most effective ways. With 2 videos and a variety of descriptive materials you’ll learn just what’s needed to use QwikCoach and get the greatest benefits from it. Option 2: Feedback from others. Think about the last piece of advice or feedback you received from your manager, teammate, colleague, or others. What problem or opportunity did it deal with? Once you’ve identified the topic, click on the associated area of competence within QwikCoach to explore Fast Answers, Tips and Techniques, Practice Ideas, or the Resource Center to discover new and better ways address the improvement opportunity and start moving in a new and better direction. Option 3: The QwikCoach Personal Development Tool. 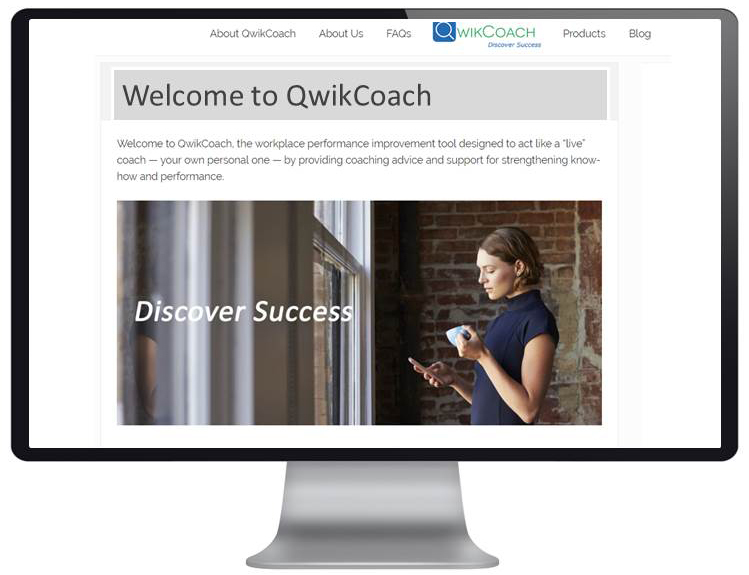 The Personal Development Tool in QwikCoach provides a convenient way to assess individual performance and makes it easy to support individual development activities because it provides direct access to relevant QwikCoach content. Just click the assessment tool for your area of interest and use it to complete a self-assessment and request 360 input from others you know and trust. I have to develop and maintain an Individual Develop Plan (IDP). Can QwikCoach help? Absolutely! The on-board IDP that comes with QwikCoach comes with an extensive set of Development Objectives and related Action Steps (with links to QwikCoach content) so you can build a great plan quickly and easily! I’m a new hire. Can QwikCoach help me? I’m an experienced worker. What can QwikCoach offer me? I’m a seasoned manager with lots of workplace experience. How can QwikCoach help me?